Justice Strategies Director, Judith Greene, has co-authored Ending Mass Incarceration: Charting A New Justice Reinvestment, with Vanita Gupta and Kara Dansky of the American Civil Liberties Union, Malcolm Young of Northwestern University Law School's Bluhm Legal Clinic, James Austin of the JFA Institute, Eric Cadora of the Justice Mapping Center, Todd Clear of Rutgers University, Marc Mauer and Nicole Porter of The Sentencing Project, and Susan Tucker, the former Director of The After Prison Initiative at the Open Society Foundations. The paper traces the history and examines the impact of Justice Reinvestment (JR) since its inception a decade ago to its current incarnation as a national initiative. The primary conclusion is that while JR has served to soften the ground for criminal justice reform, it has not achieved significant reductions in the correctional populations or costs in most of the states in which it has been conducted. This is in contrast to its original intent: to reduce corrections populations and budgets and reinvest in high incarceration communities to make them safer, stronger, and more equitable. 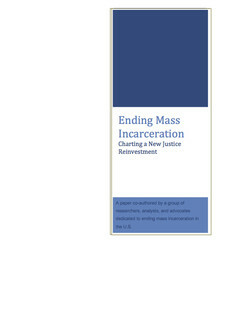 As originally conceived, Justice Reinvestment called for the reduction of corrections populations and budgets to generate savings that would be reinvested in high incarceration communities to improve public safety, and reverse the destructive effects of mass incarceration and harsh punishment visited disproportionately upon individuals and communities of color. As implemented through legislation in 18 states, the Justice Reinvestment Initiative has helped stabilize corrections populations and budgets, educate state legislators and public officials about the expense of correctional system, and persuade them to undertake reforms, but it runs the risk of institutionalizing mass incarceration at current levels. JR legislative efforts are not addressing the two principal drivers of prison populations: the number of people admitted to prison and their length of stay. When promising strategies for affecting these two prison population drivers have been proposed, they are often the first to be jettisoned as a part of legislative compromises. JR activities are typically focused on state government policy makers and state-level reforms, eschewing and sometimes excluding other important state and local constituencies, including strategic advocates and locally-elected officials from high incarceration communities. JR initiatives which focus on short-term analysis and technical assistance to state corrections officials do not build or leverage state and local capacity to move genuine justice reform forward over the long-term. JR efforts have abandoned a key premise of its original concept: reinvestment in high incarceration neighborhoods to promote safe and vibrant communities. Absent demand-side advocacy from local stakeholders, resources become vulnerable to the claims of other criminal justice agencies, including from law enforcement. There has been insufficient attention to the problem of structural disincentives that discourage and inhibit officials at all levels of government from pursuing local, innovative, non-incarcerative public safety strategies. The state subsidy for imprisonment relieves local public officials of the financial consequences of sentencing decisions which greatly increase state prison populations. A group of the nation's leading criminal justice advocates and researchers have charged that the much-lauded "justice reinvestment" strategy has failed to divert meaningful funds to minority communities who have been the most deeply affected by high levels of incarceration. In a report issued today, the advocates are sharply critical of how the six-year-old strategy--warmly endorsed by the Department of Justice only last week---has evolved in many states.